This study surveys pronunciation patterns of German vowels by Japanese learners. At present, many learners of German who speak Japanese as their L1 encounter problems in acquiring consonant clusters, intonations and rhythms of the target language. These problems are due to: 1) differences between Japanese and German consonant systems and 2) limited opportunities for learners beyond the classroom to hear German sounds and evaluate the sounds they produce. This research points to the need for a tool that enables learners to continue their learning even when they do not have access to a formal learning environment such as a school. Against this background, this study aims to create a manual for learners who wish to enhance their learning at home, by using ATR CALL Deutsch. 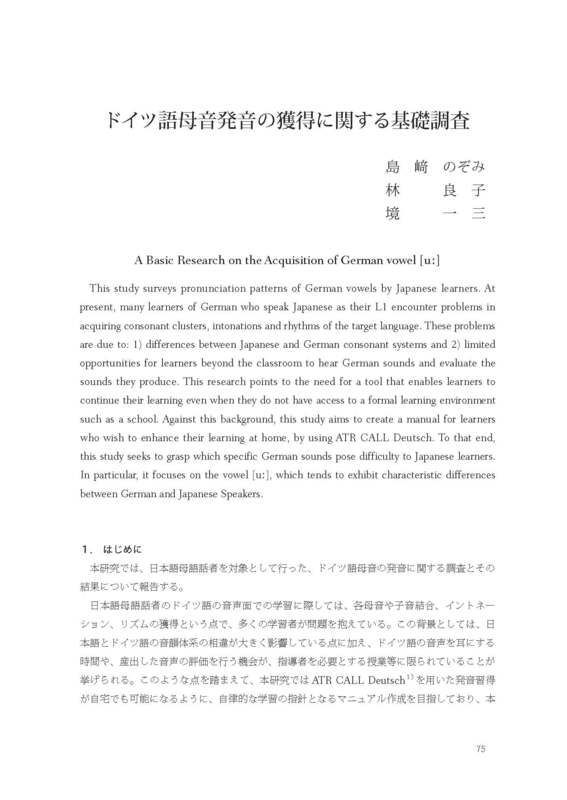 To that end, this study seeks to grasp which specific German sounds pose difficulty to Japanese learners. In particular, it focuses on the vowel [uː], which tends to exhibit characteristic differences between German and Japanese Speakers.